For too many years, this BIB (Born in Baytown) didn't know what her hometown had in a certain familiar work of art. Although I had seen the post office mural countless times, I didn’t become aware of its significance until the early 1980s. One of our reporters then at The Baytown Sun was a talented artist, Sherri Carver, and she talked often about the mural created long before she was born -- during the Depression in the 1930s. As a young child, she enjoyed looking at it during trips to the post office with her mother. The fading mural impressed, inspired her. After graduating from high school, Sherri majored in art at the University of Iowa but illness forced an early departure. That’s when she returned to her hometown and joined our news staff. Although staff artist was not part of her job description, she did illustrations for stories in addition to reporting and writing. Over the years I’ve lost contact with Sherri but I hope she knows the mural has been restored in the former post office building that now houses the Baytown Historical Museum. I think she would be delighted. FDR agreed and established the arts section of Public Works Administration, earmarking one percent of the post office budget for murals. Artists sent color sketches of proposed murals to local committees for prescreening, and those selected were forwarded to Washington for final judging. In his book, “The Texas Post Office Murals: Art for the People,” (Texas A&M University Press), Philip Parisi wrote, "Some of this government-sponsored art is genuinely powerful stuff. ... 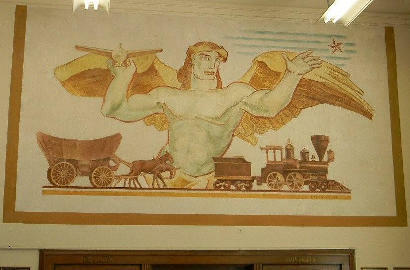 The post office in Baytown got ‘Texas,’ an allegorical picture of a hunky bare-chested god, complete with wings, about to cast an airplane out over the (post office) box-holders." When Miller was asked to show a little less skin, he enlarged the 19th century train at the bottom of the picture and raised the subject’s loin-cloth to a more modest level. For an industrial town such as Baytown, the artist could not have picked a better subject than this winged creature guiding planes o’er the horizon. After all, a whole lot of aviation fuel poured from the Baytown Refinery of then-Humble Oil & Refining Co., now ExxonMobil, and in a just a few years after the mural was painted, the oil industry in Baytown would play a key role in winning World War II. Winged Victory: Wouldn’t that be a good hindsight name for our man in the mural. All that's missing from this land to air scene is the sea. Someone should have reminded the artist about Baytown's waterfront, from fishing boats to oil tankers. We're a town of bays, spilling into the Houston Ship Channel and Galveston Bay. Because competition for the mural contracts was anonymous, leaders in the original city of Goose Creek – now part of Baytown -- had no inkling about the background of the man who submitted the sketch for the proposed mural. They didn’t even know his name. Barse Miller, the muralist, actually was better known as a water colorist. During World War II, Army Capt. Barse headed the Combat Art Section in the South Pacific and produced water colors that visually documented the war. He also worked as an art correspondent for Life Magazine. After the war, the New York native taught art at Queens College. He died in 1973. In some ways the lives of Barse Miller and FDR's friend George Biddle are similar, including their early interest in murals in Mexico, their work as water colorists as well as muralists, their combat art in WWII and their connection with Life Magazine. I bet they knew each other.